How much does it cost to travel to Seoul? How much money will you need in Seoul? ₩107,659 ($95) is the average daily price for traveling in Seoul. The average price of food for one day is ₩24,877 ($22). The average price of a hotel for a couple is ₩124,024 ($109). Additional pricing is in the table below. These average travel prices have been collected from other travelers to help you plan your own travel budget. How much money do I need for Seoul? With a population of more than 11 million, Seoul is easily the largest city in South Korea. It is also the financial, political, and cultural capital of the country and has much to offer open minded travelers. 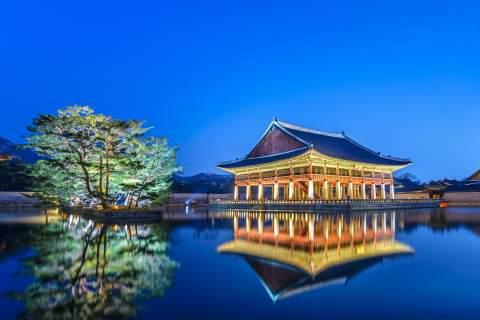 It is often overlooked by travelers who instead head to Tokyo or Shanghai, but Seoul has a wide range of cultural experiences, food options, and historical sights. Seoul is a city of contrasts with ancient traditions, flashy technology, religious temples and a modern youth culture. It is also more affordable than many of the other Asian metropolis' to which it is often compared. If you're looking for an interesting and different experience that is a little off the tourist trail, Seoul can definitely offer that opportunity. Seoul's climate is humid continental and subtropical transitional. Summers are hot and humid with the East Asian monsoon occurring between June and September. August is the hottest month with temperatures climbing into the mid 80 degrees Fahrenheit. Winters are cold with temperatures dropping below freezing. Winters are also drier than the summer months and there are, on average, 28 days of snow every year. There are a good number of attractions worth checking out in Seoul. Head to Gyeongbok-gung, which is the city's most impressive Joseon Dynasty-era palace. Changdeok-gung was built in 1405 and is second in importance to Gyeongbok-gung. Namsan Park is in the center of Seoul and is an ecological island surrounded by urban districts. It's a wonderful place to relax and people watch. In 1988 Seoul hosted the Summer Olympics. You can visit the Olympic Park which includes a lake, a large field covered with grass, and a square with sculptures. It's a popular spot for young couples to have their wedding photos made. There are also some great running trails throughout the park. Jongmyo Shrine is probably the most famous shrine in South Korea and is devoted to the royal family members of Korean dynasties. It's an easy place to walk around. Seoul is administratively divided into 25 districts and each district can be further split into subdistricts. The Han river splits the city with Gangbuk being the northern and more historical side and Gangnam being the southern and more modern side. The two largest areas are Jongno and Jung in the north and Gangnam in the south. Jungno is where you'll find many of the city's palaces and government buildings. It's one of the main centers of the city and attracts a large number of tourists. Jung is to the south of Jungno and has European style government buildings, the City Hall, and the Bank of Korea. There are also shopping areas and markets. Other notable districts that are north of the river include Seodaemun, Mapo, and Yongsan. Gangnam, south of the river, is at the modern heart of Seoul. There are skyscrapers, flashing signs, and some of the country's most expensive real estate. Other notable areas south of the river are Songpa, Yeoui-do, and Yangcheon. As Seoul is a large city, there is no shortage of activities that you can enjoy around the city. Check out the Sejong Center for Performing Arts, which is the oldest and one of the largest theaters in downtown Seoul. Also look for events at the Seoul Art Center and KBS Hall. Amusement parks in the city include Lotte World, Everland (a Korean take on Disneyland), Seoul Land, and Children's Grand Park. In Korea, dining is a social event. There are countless restaurants around the city that are filled with crowds having a good time. It can be difficult to locate an English menu so just look around and point out what you'd like to your waiter. Budget restaurants are easy enough to find. There are street stalls that sell noodles and 24 hr Korean fast food restaurants. Korean barbecue restaurants are also common and delicious. Seoul's subway system travels throughout the city and is convenient to use. It's also the second most used system in the world. There are 18 lines that are distinguished by colors. Signs are written in both Korean and English, and often Chinese and Japanese as well. The bus system is also very comprehensive. There are four kinds of buses. Yellow buses follow short routes around tourist areas. Green buses travel between neighborhoods and the subway. Blue buses cross town and Gyeonggi (green and red) buses connect different cities. Taxis are very nice and reliable. The prices are generally reasonable if you're not traveling far. Drivers rarely speak English so it is best to have your destination written down.